On Wednesday December 5, 2012, according to published reports, jazz pianist and legend Dave Brubeck passed from heart failure in Norwalk, a few miles from his home in Wilton, CT. He lived just a day shy of his ninety-second birthday and during his life his music touched millions of listeners, both those who loved jazz as well as those who just loved good music. I'am currently spending time in Portland, Oregon and so I was jolted by the news of Dave's death sometime early afternoon EST or about 10 am PST. Dave had been in failing health for sometime now. Despite his increasing frailty, he continued to perform on a schedule that would challenge a man twenty years younger. I recall seeing him play with his most recent quartet about a year ago at the Tarrytown Music Hall in Tarrytown , New York as he was approaching his ninetieth birthday with a celebratory tour. The Music Hall was a particularly appropriate setting to see Dave play, as it was like to two old friends acknowledging each others longevity and relevance. Dave needed some help to the piano, but when he sat at the ivories the music came gushing out of him with no lack of vitality and invention. Dave's playing has always been one of subtle support and unerring direction. His music embodies a joyful, airy lightness despite his sometimes heavy chordal work. He always seemed to eschew the self-searching ruminations of a Bill Evans or the percussive, layered approach of a McCoy Tyner, two of his most formidable contemporaries. When you went to a Brubeck concert you came out with a smile on your face and a beat in your heart. Dave's legend as a pianist and composer spans from the time he came out of his California college band days at Mills College, where he studied with his mentor the French composer/educator Darius Milhaud. Dave had a brilliant ear and an advanced harmonic sensibility but he always struggled with reading music. Dave formed an early band with college mates Cal Tjader and Ron Crotty. He then went on to form a quartet with alto saxophonist Paul Desmond, whom he meet in 1944 while in the army during WWII. Dave served in General George Patton's Third Army, and was spared having to participate in the Battle of the Bulge. In an Jazz Wax interview from 2010 he spoke of narrowly escaping a harrowing experience behind German lines despite being in the band for his tour of duty. After the war it was Dave and his wife Iola who virtually created the unlikely pairing of academia and jazz music; the college tour, that persists today as a vital vehicle for spreading the music, while at the same time creating a viable alternate source of revenue for jazz musicians. All of Dave's musical milestones have been well documented and his lasting musical legacy includes the well known "Take 5" ( which is solely credited to his altoist Paul Desmond but clearly has the Brubeck stamp upon it), his equally time altered Blue Rondo a la Turk, his compelling jazz standard "The Duke" and his uplifting and appealing "In Her Own Sweet Way". These are just the more recognizable compositions that Brubeck leaves as part of his musical legacy. He never let himself become stale, vitalizing his music with the inclusion of poly-tonality and alternating time signatures and infusing his compositions with influences from other cultures, while always retaining an uplifting message and a joyful, exuberant delivery. But what about Brubeck the man? A man who lived almost ninety-two years and who was married to the same wife, the former Iola Whitlock, for seventy of those years, an astounding testament to he and his wife's eternal commitment to each other. A man who raised six children, five who have followed in their father's footsteps to become professional musicians. A veteran of WWII who served his country proudly, but who was forever changed by what he experienced in the war. A man who battled popular social convention and integrated his army band known as "The Wolfpack" during WWII. He later continued his commitment to racial equality by hiring bassist Eugene Wright as a permanent member of his famous quartet in 1958 and refusing to play in venues who wanted him to replace Wright. One time he cancelled a television appearance because he found out the producers were planning to keep the black bassist off camera during the entire performance. For years he served as a State Department cultural ambassador of jazz music, with concerts performed all over the world proselytizing American culture and good will to our cold war enemies. As a result of those State Department trips, where he shared the stage with many with African American artists, Brubeck and his wife Iola worked in collaboration Louis Armstrong on a musical titled The Real Ambassadors. The musical dealt with the nature of God, civil rights in the U.S., the music industry and America's place in the world during the cold war era. Louis Armstrong was the main character and it featured performances by singer Carmen McCrae, the vocalese group Lambert Hendricks and Ross as well as Brubeck with Eugene Wright and Joe Morello. To say that Brubeck the man was anything less than Brubeck the artist is to miss the point of this man's life. In searching the net for personalized recollections of Mr. Brubeck I came across some splendid examples that seem to authenticate how generous of time and spirit Dave Brubeck was to his fellow men. "Dave, I believe was a genius, genius being defined as one who changes the course of history. In Dave's case, musical history. He was a prolific composer in all genres, a pianist of originality and power, who influenced all of us and has left an enormous legacy in recorded works. He was a giant among giants. And may I add, a humble, kind and generous human being. In writing my book on his music, I got to know him more intimately. He was never too busy to come to the phone when I called. Iola, Dave and his children have given the world some amazing and exciting music that will be around a long, long time. " "I have the highest admiration for Dave, who has been an inspiration to me and my music for a lifetime. He might never know how much his encouragement of me and my music has meant to me- but this is the truth. Gayle and I treasure the friendship that we had with him and have with his amazing wife Iola." Drummer Jack DeJohnette posted this on Facebook "We lost an amazing pianist. 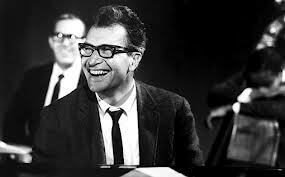 composer & humanitarian today, Dave Brubeck. He left us with a wonderful legacy of great music and he will be missed by many." British pianist Liam Nobel had a heartfelt remembrance of Dave on his London Jazz Blog An excerpt from it demonstartes how open and encouraging Brubeck could be to other artists: "Perhaps it's this that always drew me to his music: a quietly spoken individualism born of a sense of curiosity about music in all its forms. When I sent him my trio's album of versionsof his tunes. he sent me a letter that was full of generosity and warmth. He seemed more interested in what he could learn from our interpretations of his tunes than whether we had done them justice. That blew me away, it still does. I'm still learning from that letter." Many others posted similar experience; being influenced by Dave's music or being personally touched by his generosity of spirit and openness. The true measure of a man's life lies in the memories and legacies he leaves behind. We certainly mourn the passing of Dave, but by any meaningful measure Dave Brubeck seems to have exemplified a life well lived. My sincerest condolences to his wife Iola and his family. He will be missed.